Uses: Health Care Colors: Gray/White Lengths: 7 panel 13'-1" Heights: 6'-0"
Screenflex medical privacy screens allow medical professionals to adapt available space to the needs of each patient and to accommodate for proper healthcare equipment. 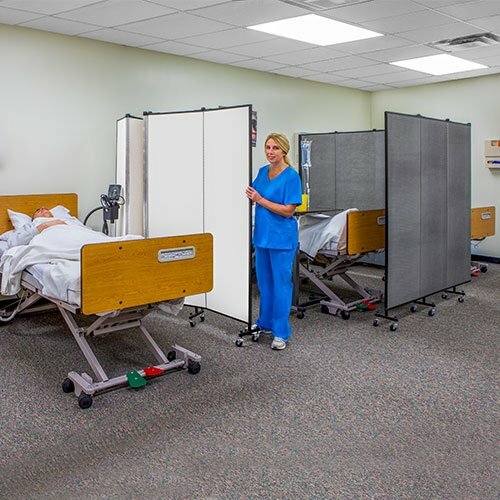 Since Screenflex portable medical privacy screens roll on self-leveling casters, they provide more flexibility than hanging curtains which must be used in the same configuration. This unique caster feature adjusts to varying floor materials, door thresholds, and electrical cords allowing dividers to remain stable when moved throughout the medical center, opened for use, or closed for compact storage. To serve you better we have designed our medical privacy screens to store compactly in a 2′ by 3′ space.